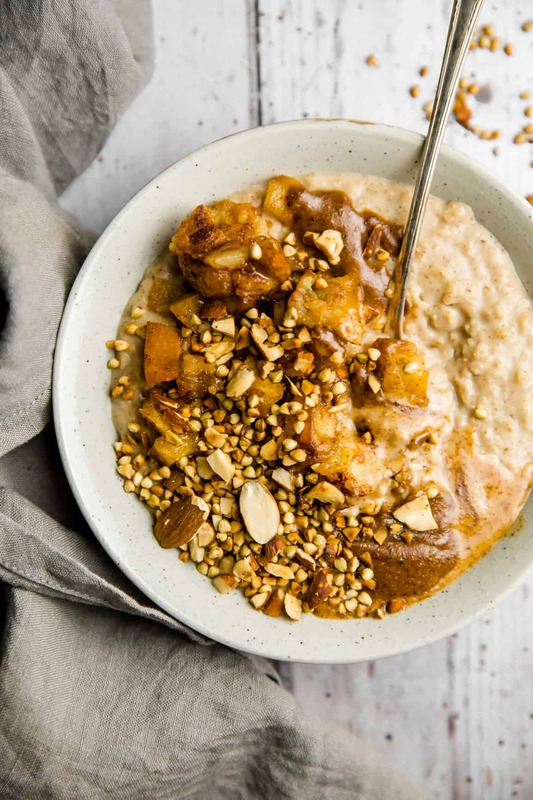 This sugar free frangipane porridge is the best way to enjoy the delicious taste of a traditional King Cake but the healthy way. Naturally sweetened with banana, packed with fibers and gluten free, it will keep you full and energized the whole morning. The true story is that I woke up this morning and realized that Epiphany was in 2 days and I still haven’t post any related recipe! After some reflexion, I concluded I had to make something pretty simple and quick to prepare, but also that nobody want to see a traditional king cake today! Don’t get me wrong, I absolutely love king cake! To be more precise I’m kind of crazy about it and could eat the whole cake – best way to get Fève isn’t it? I love the creaminess of the frangipane filling, this intense almond flavor and that crispy golden pastry puff around. But to be honest, after holiday season and all its feasts, I’m not really into eating this kind of heavy and oily cake. I would prefer something lighter, more nourishing, but still with the delicious frangipane flavor. So I thought porridge would be the best alternative! During winter, I use to eat porridge often for breakfast, as it is a very warming, comforting and nourishing food. 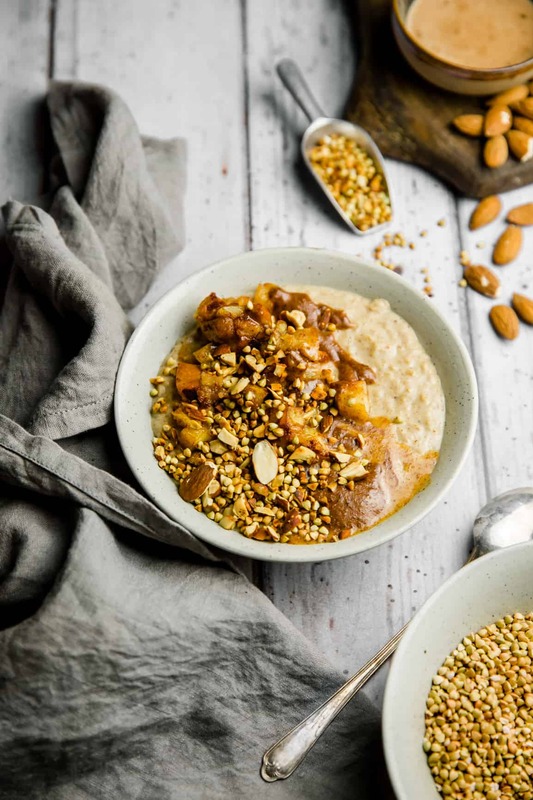 Porridge is often referred as a heavy boring and tasteless meal, but it’s totally wrong! When well cooked it is an absolutely creamy and nourishing breakfast! The oats contain a lot of good fibers that keep you full for a long time and can also help lower your cholesterol level. The secret is about slowly cooking the oats in a sufficient amont of liquid to allow them to soak and soften. 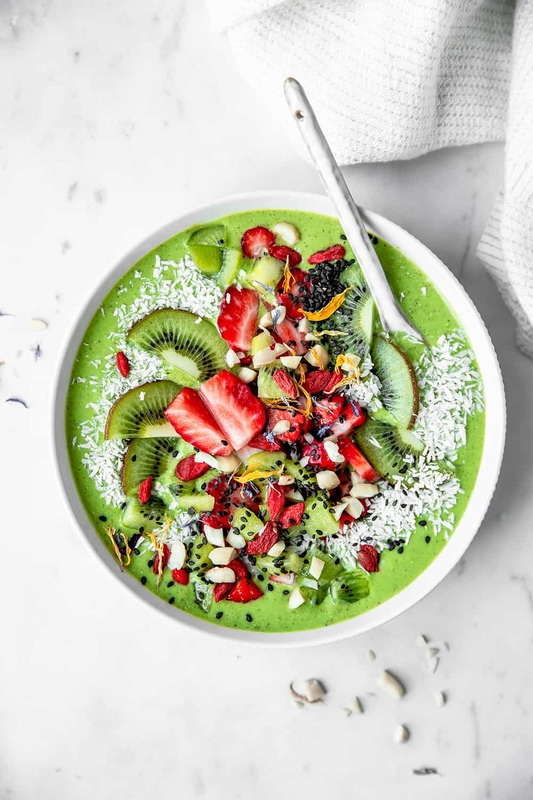 Also, porridge just like smoothie bowl, is very versatile and you can make it different everyday by changing the toppings or the add-ins. 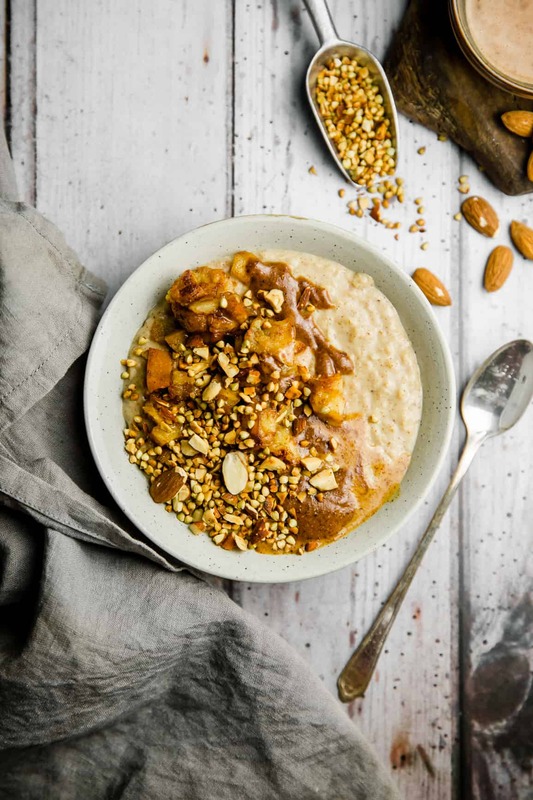 To make this frangipane porridge, I’ve started from a very simple oatmeal recipe and added almond meal, almond extract and almond butter to get this dreamy almond flavor and add some more creaminess. Not only almond butter is delicious, but if you use unsweetened and added fat free natural almond butter, it is also a very good product, packed with healthy fats, antioxidants, calcium and proteins! For a lighter version, I recommend to use almond flour instead of almond meal as it contains less fat due to the process. And to well start the year, I made this porridge completely added sugar free! Even if unrefined sweeteners like maple syrup, agave or date syrup are better than refined ones, it is still sugar that nurture our sugar cravings. 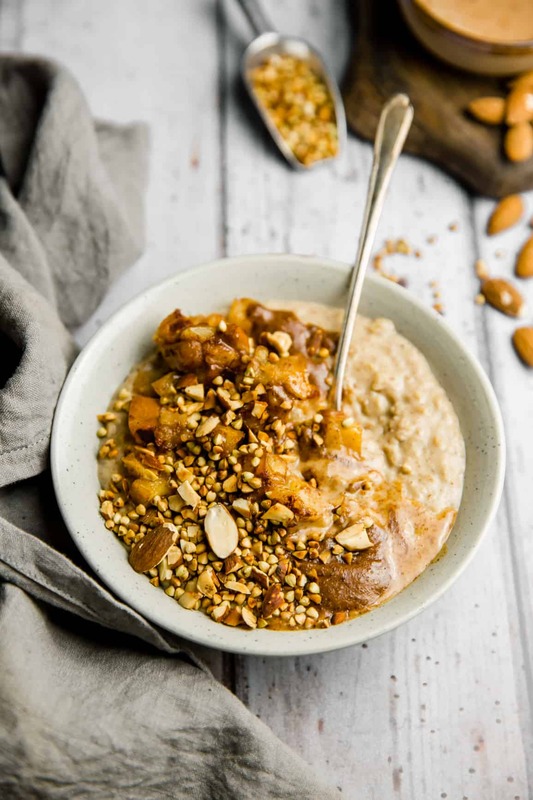 In this porridge, all the sweetness comes from the mashed banana and you will be surprised to see how sufficient it is! You can also substitute mashed banana for unsweetened applesauce or any other fruit purée. For this new year I suggest to make the test to reduce your sugar consumption and see how your tastebuds adapt and how your body feel better. I wish you all a happy new year! May all your dreams come true. 1. Peel and mash the banana using a fork until puréed. 2. Place the mashed banana, vanilla extract and almond extract in a saucepan and cook over medium heat for 2 minutes to allow the flavors to infuse. 3. Add the almond milk and the oats and stir to combine. 4. Bring to a boil, then reduce to low heat, cover and allow to cook for 5 minutes stirring often to prevent to stick and burn. 5. Add the almond meal, almond butter and water, and stir to combine. 6. Cook for 1 more minute, then remove from heat. Note: if your porridge seems too dry, you can gradually add water until you reach the desired consistency. 1. Heat the coconut oil in a skillet. 2. Cut the apple into small dices and put them in the skillet. Cook for 5 minutes on medium heat, stirring often. 3. Add the maple syrup (optional) and cinnamon and stir to coat. Cook for another 2-3 minutes until the apple is soft and beautifully browned. 1. Toast the almonds and buckwheat groats in a dry skillet until browned. 2. Serve the porridge into a bowl and top with the caramelized apples. Drizzle some almond butter and garnish with the toasted almonds and buckwheat. 1. Peler et écraser la banane à l’aide d’une fourchette jusqu’à réduite en purée. 2. Mettre la banane écrasée dans une petite casserole avec l’extrait de vanille et l’extrait d’amande amère. Cuire à feu moyen pendant 2 minutes afin de faire infuser les arômes. 3. Ajouter le lait d’amande et les flocons d’avoine et mélanger. 4. Porter le mélange à ebullition puis réduire à feu très doux, couvrir et laisser mijoter pendant 5 minutes en remuant de temps en temps. 5. Ajouter la poudre d’amande, le beurre d’amande et l’eau. Bien mélanger. 6. Cuire de nouveau pendant 1 minutes puis retirer du feu. 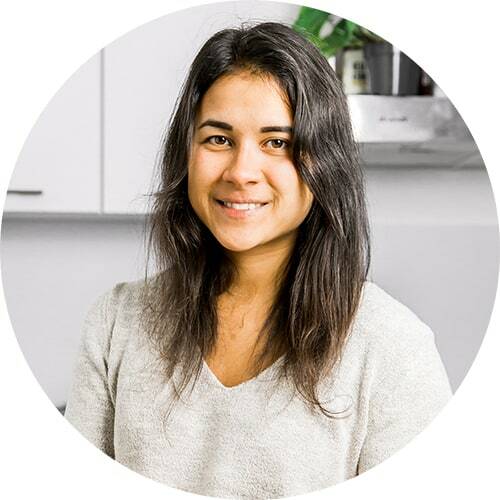 Note: si votre porridge semble trop sec et pâteux, ajouter progressivement un peu d’eau jusqu’à obtenir la consistence désirée. 1. Faire chauffer l’huile de coco dans une poêle. 2. Couper la pomme en petit dés et les mettre dans la poêle. Cuire à feu moyen pendant 5 minutes en mélangeant fréquemment. 3. Ajouter le sirop d’érable (optionnel) et la cannelle en poudre et mélanger pour bien enrober les pommes. Cuire pour 2-3 minutes supplémentaires jusqu’à ce que les pommes soient bien tendres et caramélisées. 1. Faire toaster à sec les amandes et les gruaux de sarrasin dans une poêle, à feu moyen. 2. 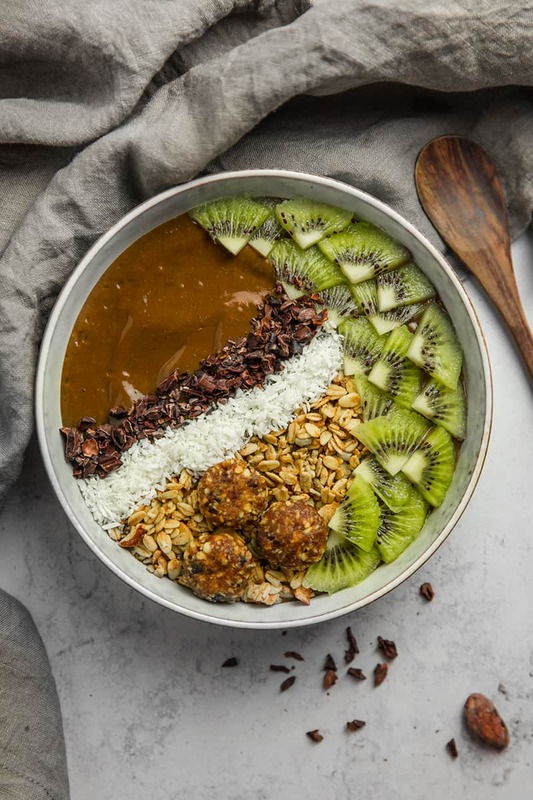 Servir le porridge dans un bol et ajouter les pommes caramélisées. Arroser de beurre d’amande et garnir des amandes et sarrasin toastés.